In a city like San Francisco, the concept of "good value" when it comes to dining is pretty relative. But given the amount of money we have to spend on rent, SF residents want to ensure that a special meal out is a truly mind-blowing experience that's worth the cash -- and a little bit snazzier than a Mission burrito (which is always a good choice, for the record). So we present to you the best-value San Francisco tasting menus: meals that you probably won't be going out for every day, but which are genuinely incredible dining experiences, and for the most part, won't break the bank. Now, we're talking full-on tasting menus here, so none of that three-courses-with-an-optional-dessert nonsense. 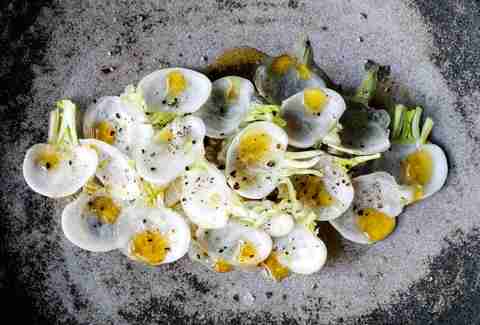 These tasting menus offer the most bang for your buck in all of San Francisco. 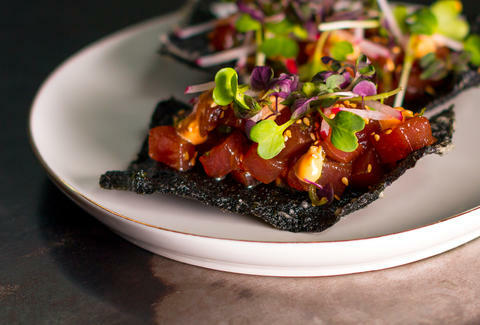 Nominated for best new restaurant this year by the James Beard Foundation, Liholiho Yacht Club has been making waves ever since it opened, and consistently wows diners with its Hawaiian-influenced menu. Take on the Ohana Table to access their 10- to 12-course tasting menu, with dishes like duck liver toast with pickled pineapple, and fried oysters with beef carpaccio. As Stitch told us, "ohana" means family, and you'll definitely need them to tackle Liholiho's large portion sizes for this family-style meal. It'll run you about $55 per person, and you’ll need eight people minimum to get a reservation, with a max of 12. There’s only two seatings per night, so keep your Liholiho radar up. Also, if the poke or game hen isn’t part of your tasting menu, request that you add it. Trust us, you need these things. Taking home the title of Bon Appetit's best new restaurant in 2015, this laid-back, one-Michelin-star Mission eatery offers one of the most affordable tasting menus in the city. Clocking in at $60 (with an optional $40 wine pairing), this seafood-and-vegetable-heavy restaurant will get you pretty stuffed with its family-style tasting menu. Surprisingly, the French fries are on the list of dishes that you really shouldn't miss. Brined for four days and double-fried (once more right before coming to your table), and served with a smoked apple barbecue sauce, they're maybe worth a trip unto themselves. The food here can be deceptively simple -- a baby lettuce dish, for instance, served with crushed avocado and pistachio crumbles, may not sound like a lot, but it’s simple, clean, light, and delicious. And don't forget the drinks. They're tasty... and named after Reservoir Dogs characters, so that's an added bonus. Consistently sold out with a seemingly never-ending wait list, the Ichido supper club, hosted by chef Geoffrey Reed, is a weekly Japanese-influenced pop-up. Chef Geoff forages for all his own ingredients and catches all of the local fish himself, before cooking it up and serving it to his hungry attendees. 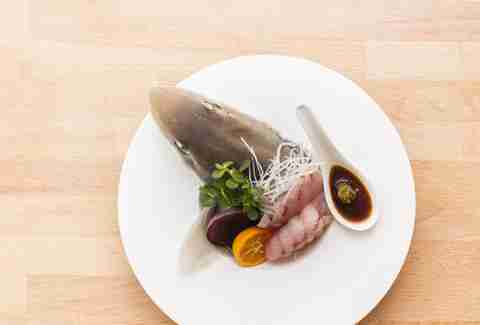 You'll get to taste shark, stingray, and more terrestrial dishes like pork belly. Ichido is part of the Feastly network of ongoing pop-up supper clubs, so just keep an eye out to book a ticket before they run out (as they always do). Bonus: chef Geoff is known for taking his guests out for a fishing lesson. 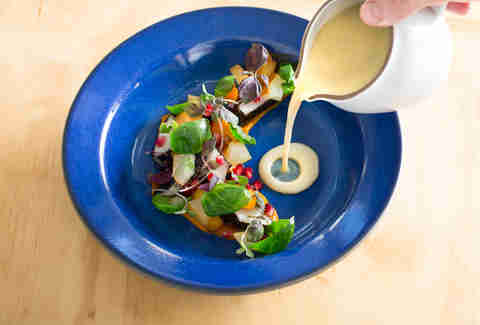 At $75 a pop for six courses, with an additional $40 dollar drink pairing, it's an exceptional deal. One of San Francisco's only Guamanian restaurants, Prubechu's tasting menu is unique on this list. Adding a modern twist to classic Chamorro dishes, you'll taste items like homemade, sous vide spam (yup) served with a fried egg, as well as shrimp ceviche and chicken ceviche (don’t worry, the chicken is lightly grilled and perfectly safe to eat -- it’s inspired by a Chamorro dish called kelaguen). You'll get five savory courses plus one dessert for $65. These folks bring lots of goodies from their native Guam, so make sure to check out their drink selection -- you'll find a lot of spirits on the list here that you'd be hard-pressed to find anywhere else in the city. The Progress takes the choose-your-own-adventure route with its tasting menu. For $58 dollars, you choose four dishes among dozens of excellent options. But don't let your FOMO get the best of you -- other small, accompanying dishes will come out, and if you're really jonesing for a fifth (or sixth…) course, you can add more plates for 10 bucks a pop. The menu includes dishes like Spanish octopus, and boquerones, but it's also totally vegetarian-friendly -- there's a great dish involving beautiful spring potatoes and porcini, and another that pairs fresh ricotta with nectarines. At Commonwealth's $80 six-course tasting selection (an additional $50 for the wine pairing), you can eat great food, and feel good about going out for a nice dinner, too. This spot donates part of its proceeds to a different local charity every two weeks. Right now, dinners are benefiting the Cooperative Food Empowerment Directive -- and a total of over $222,000 has been raised to help dozens of worthwhile causes. Among them are the San Francisco Food Bank; SF SPCA; and the St. Anthony Foundation, which helps to provide support, shelter, food, and clothing to the homeless. 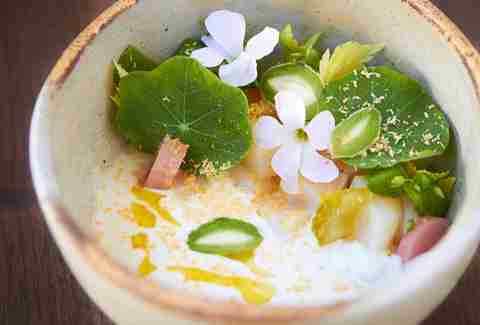 The food here is layered and complex, but approachable and largely familiar: the diver scallop dish, for instance, includes white miso, corn, tarragon, and fennel. Known for its porcini doughnuts and sardine chips (which are worth the hype -- go ahead and order them if they happen to not be on your tasting menu), Rich Table's 12-course $89 chef-choice tasting menu includes dishes like foie gras torchon and Maine lobster. It's a good thing it's super-casual... you may be able to squeak by with wearing a much-needed elastic waistband. Reservations at Rich Table can be tough to come by, but there are about a dozen bar seats for walk-ins. If you're going that route, then get there early, and if you want to bring a bottle of something-something, the corkage fee will add another $30 to your bill, or you can pay the extra $50 for the wine pairing. The Michelin-starred restaurant is small and cozy, with less than 30 seats, and you’ll usually find it littered with cuddly couples celebrating something special. Your only option here at Sons & Daughters is the seven-course tasting menu, at $115, with an additional $79 for the drink pairing. Spoiler alert: you'll get treated to some extra amuse bouche and bread courses along the way, including appetizer dishes before each main course. While $115 may be pushing the upper limits a bit, knowing that all of the ingredients on your plate are locally sourced in the Sons & Daughters Farm in Santa Cruz helps make the price tag a bit easier to swallow... plus the fact that the dishes are consistently remarkable and pair unusual flavors, like the rabbit with white peach and black garlic. Since seating is relatively limited, it's a good idea to keep an eye on reservations to snag a free table when they're available. If you're looking for dinner and a show, reserve a spot at SPQR's chef's counter. You'll sit right in front of the open kitchen, and watch the magic happen while you eat. It offers a five-course pasta tasting menu -- all served in miniature portions, for about $50. 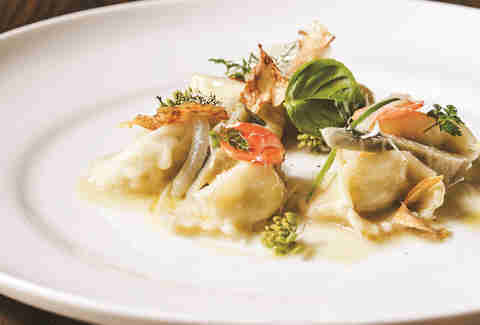 It's a great option if you just can't choose among all the excellent pastas that SPQR offers. The uni fettuccine, abalone pasta, and Meyer lemon pasta should be requested, if you don’t see them as part of your five (or just live a little and order them after the tasting menu’s over). And if you happen to arrive a little early for your reservation, take advantage of the excellent wine bar. Sister restaurant to the Michelin-starred Aziza, the Financial District's Mourad offers a nine-course Moroccan tasting menu. At $120, with an optional $85 pairing, its tasting menu gives you a great sampling of the unique dishes offered a la carte. This place is on the pricier side, but Mourad has the market cornered when it comes to a Moroccan tasting, and it definitely delivers. The tasting menu will give you lots of strong flavors, opening with a harissa seafood course, moving onto a salmon and kumquat course with zhug (a Middle Eastern hot sauce), and hen egg with baharat (an earthy Middle Eastern spice blend). You may want to also try the cocktails, which are just as delicious as the food. Though it's on the larger side for a San Francisco restaurant, reservations are still encouraged, but this place is definitely more walk-in-friendly than others on the list. Bar Tartine in the Mission District is heavy on local produce and local sourcing, putting in every effort that it can to make its ingredients in-house -- and that includes the cheeses, spices, and even koji (a fungus used to ferment soybeans for soy sauce and bean paste, among other tasty things). With all that manpower, the $78 tasting menu feels well worth it. The plates are well-composed, and dishes feel light and won't weigh you down, even after indulging in the dozen-course family-style feast. Because everything is locally sourced, much of the menu rotates and depends on seasonality and availability. Right now, you’ll find dishes like pork loin with peas and carrots, as well as fava bean croquettes with eggplant sauce and yogurt. 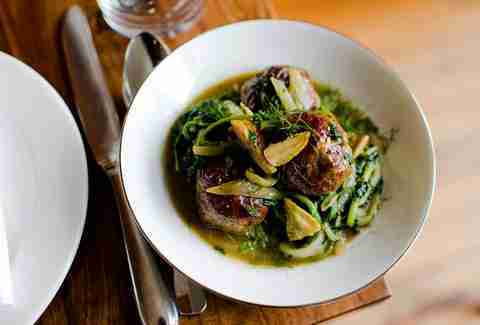 While meat is usually the star at many restaurants, the vegetable-heavy dishes at Bar Tartine tend to steal the show. Don't let the name fool you: Mr. Pollo serves up one hell of a tasting menu. It's one of the cheapest in the city, at just $30 for a four-course tasting menu. Everything is cooked by one chef, and his partner serves: it's intimate, no-frills, and delicious. The menu rotates regularly and is always chef’s choice, so it’s a bit of Russian roulette with what you’ll get. Recently, we experienced asparagus soup, and shrimp & bok choy with garlic-cilantro corn. The one mainstay most people rave about is the chicken arepa, which is consistently one of your four courses. With only about a dozen seats and three seatings a night, getting a reservation can be a little tricky. There's no website, or social media presence, just a phone number you text to reserve a seat. A recent addition to the San Francisco dining scene, Oro offers risk-taking diners a fun option with its $75 blind tasting menu. 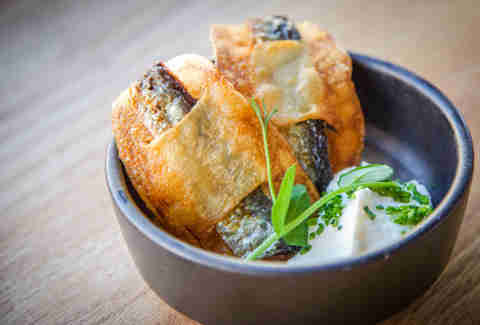 Chef Jason Fox (also of Commonwealth) chooses five courses for you, including a shared plate for the table. If you want to splurge on something, go for the amazingly crispy pig ears or the squid. The wine pairing will tack on another $50, but is well worth it, given that wine director Kelly Evans (formerly of Saison) is behind the selection. Offering over 100 wines, Evans is on-hand to provide you and your dinner guests with a thorough education on what wines you’ll be drinking and why. Rounding out the list is the Outer Richmond darling, Cassava. While brunch may be what most people go to Cassava for, its super-affordable $42 four-course tasting menu deserves more attention than it gets. You'll be treated to a salad course, two mains, and a dessert course… and since the wine pairing is just another $28, it's hard to say no. Cassava's menu has some Asian influences, giving diners dishes like an heirloom tomato salad with shiso, guac, crème fraîche, and brown rice. Just make sure you save room for dessert -- the panna cottas are exceptional. An added bonus: if you're feeling like you need to walk off your meal, the ocean is a short trek away… and so's a movie theater, if you just want to veg out. Patrick Wong is a recent contributor to Thrillist, but a long-time overeater and non-sharer. Follow him to his next bang-bang meal: @peewong.